USA Zone - Who is Obama ? What is Chemtrails Doing To Your Brain? Religious Festivals + The Answer is? + Prophecies Plus! Israel Zone - SYNAGOGUE of SATAN - 6xDay War Miracles! WHO & Where is Israel Today? Global Banking - Money £$ Exposed? EU Zone: CERN = BREXIT & OUT! BRITISH Zone - JOSEPH Of ARIMATHEA + AD37 EXHIBITION BRITAINS HEBRAIC HIS-STORY ONLINE /// PLANET X/ NIBIRU NEWS UPDATES!! !/// SUPERNATURAL TESTIMONIALS * Including "OZ's" Story- Entitled "The Power Behind The Wheel"/// Sept2009 GLOUCESTER CATHEDRAL- CLASH oftheKINGDOMS ///"When The Nation Prayed and Acted... THE PROVIDENTIAL HAND OF GOD IN THE SECOND WORLD WAR (DUNKIRK WAR) /// BREXIT & OUT 2016 - 2019 /// CHEMTRAILS is REAL? COUGHING A LOT? - WHY ARE 666 NUMBERS USED? = "CERN" = THE TRUTH ? ALIEN ENCOUNTERS OF THE DEMONIC KIND? 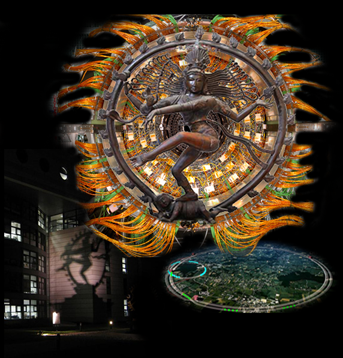 "We Have Arrived At The Final Conclusion"
"CERN, GOD and TIME 2017"
Europe – The rise of the Horned god. Be afraid! Last week saw the opening of the Gotthard Tunnel – the deepest and longest tunnel in the world, running for an amazing 35.7 miles beneath the Alps. Something to celebrate? Definitely! Switzerland thought so too, and they pulled out all the stops, staging a glittering two part extravaganza before an audience of 80,000, which included a host of world leaders such as German Chancellor, Angela Merkel; President of France, Francois Hollande; Prime Minister of Italy, Matteo Renzi, and many others. But the overtly pagan and satanic content has both puzzled and amazed spectators, provoking not a little stunned complaint. Highlight Films presents: Revealed, a new documentary film in production following the theory of Hitler's escape to Argentina. In 1945, the world was convinced that Adolf Hitler and his mistress Eva Braun had committed suicide in a Berlin bunker, though this theory lacked proper documentation and evidence. U-boats off the Argentinean coast. Yet, it wasn't until the recent declassification of certain documents by the Argentinean government and the FBI concerning the post-WWII era that researchers began to take the rumors seriously. Revealed will examine the declassified reports and eyewitness accounts of Hitler's life in Argentina in order to recreate the dictator's final years. In spite of the intense secrecy under which he lived, many saw and even worked for Hitler. Revealed will present the disturbing possibility that one of the world's most evil men was allowed to live out his final years in utter tranquility. Hi everyone, REVEALED is still in production. We have amazing footage, including interviews, filming in secret locations in Argentina and unpublished documents. We are looking for the best way to make this film available for the public, without turning it into a cheap TV drama or presenting it as a kind of reality TV show. We believe that although the fate of Adolph Hitler will never be agreed upon, our findings should be published and discussed openly and seriously. We are now seeking finance for the completion of the film. We have decided not to commit to any TV channel or network: once completed, REVEALED will be available online for free for anyone who is interested in this amazing story. The Fourth Reich is Here!!! ADOLF HITLERS DAUGHTER...THE LIKENESS IS UNCANNY! This Amazing Story Starts Here - when I saw this film back in the 70's! "This picture shows numerous thoughts & further insights to HOW the Illuminati like to show what there intentions are for the FUTURE TIMES we NOW Live in!!! IS GERMANY'S ANGELA MERKEL- REALLY HITLERS DAUGHTER? ADOLF HITLER LOOKS LIKE "ANGELA MERKEL" VIEW THESE 3 CLIPS! WHAT DO YOU THINK? http://www.youtube.com/watch?v=YdHNhf... / http://www.youtube.com/watch?v=DTwNhY... / http://destination-yisrael.biblesearc... - * SO IS GERMANY'S ANGELA MERKEL REALLY HITLERS DAUGHTER? MAY WE SUGGEST YOU GOOGLE THIS HEADER! - "HITLERS FROZEN SPERM"
PLUS... "TESTAMENT IN STONE" - THE LIGHT IN THE NORTH" - THEY CAME TO A LAND"
SIT BACK & WATCH THIS VIDEO - RECORDED BACK IN THE 1970'S/80'S BY COVENANT PUBLISHING CO. LTD. WE FEEL VERY PRIVILEGED TO PROMOTE A SELECTION OF DVD'S SHOWING BRITAIN'S HERITAGE & LINKS WITH THE HOLY LAND & THE 10 LOST TRIBES OF ISRAEL!!! THE DVDS REVEAL EVIDENCES OF "JOSEPH OF ARIMATHEA' & FRIENDS TRAVELING TO CORNWALL - WHICH INCLUDED THE "BOY JESUS " COMING TO THESE SHORES AS WELL - 2000 YRS AGO! "And did those feet in ancient time walk upon England's mountains green...? So asked William Blake in his immoral hymn "Jerusalem" - He was in no doubt Who was. Whether JESUS did or did not visit the West of England during his unrecorded youth is an open question but there is too much EVIDENCE for this story to be dismissed lightly. Trade for example: Joseph's export of TIN from Cornwall, and copper & lead from Somerset, is significant. In addition, there are the twelve tax exempt hides of land granted to Joseph and his companions when they came to England in 36AD and recorded in the DOMESDAY Book a thousand years later. The Glastonbury Thorn , old manuscripts and the most ancient site of Glastonbury Abbey all bear telling testimony that MAY WELL SILENCE THE SCEPTIC! Covenant Publishing Co films are designed to make us stop and think. It is easy to forget while immersed in the day - to day trivial of a busy life, that search for Truth is something fundamental to ALL of US. Put it off, submerged it or defer it as we may, the desire to know something greater then self is deep in OUR BEING. The aim of "Covenant Publishing Co. Ltd and its films, is to state and expound the fundamental tenets of the CHRISTIAN FAITH, and to trace the course of its development through the ages, paying particular attention to the neglected years of the early centuries. A fresh approach to these ages-old TRUTHS has evoked an inquiring response to these things and a desire to reflect and converse about their revelance to our daily lives. This Faith has been the mainspring of ALL that is best in this country's history, but equally important for each of us is the opportunity that such reflection brings to relate these simple truths to the complex problems that LIFE presents to ALL of US. HIS-STORY REVEALED - UPDATED 2016 !!! BRITAINS & EUROPES ( 3000 YRS OF CHRISTIANITY) - HISTORY EXPOSED FOR SUCH A TIME AS THIS!!! * SO DID "JOSEPH OF ARIMATHEA"& "THE BOY JESUS", REALLY COME TO BRITAIN 2000 YRS AGO? YOU MIGHT FIND THESE CLIPS INTERESTING! YOU CAN PURCHASE COPIES OF THESE DVD'S! - PLEASE SHARE INFORMATION WITH FRIENDS & COLLEAGUES... AS "GOD" IS EXPOSING SOME AMAZING HIDDEN TRUTHS IN THESE END-TIMES! * SO WHO WERE ANNE & JOACHIM? - YOU'LL BE AMAZED AT THE ANSWER !!! The Ministry of David Hathaway: one of Europes largest evangelistic ... church growth in Kiev until some of the largest churches in all Europe were in Ukraine! Tomas Sandell is a Finnish journalist who has been accredited by the European Union. He is today the Founding Director of European Coalition for Israel. is a Finnish journalist who has been accredited by the European Union. He is today the Founding Director of European Coalition for Israel. EUROPE... AND THE INTERESTING STUFF? How Germany and its financial partners in the Third World profit from poverty! I found the text below in the German Foreign Policy Newsletter and translated it for you. I thought you might be interested in how Germany and Micro finance Institutions it serves in the Third World profit financially from the ill fortune of the poor. UK colleague Rodney Atkinson has made a video showing how the EU was founded in large part by "ex" Nazis (http://www.youtube.com/watch?v=7Nf5KeC4dAs). Whether this is just a coincidence or ties in with that concept, it is interesting reading. as an effective tool to combat poverty - "helping people help themselves" - they actually drive most of the borrowers into a debt spiral, often ultimately causing them to lose any funds available for subsistence. They are, however, profitable for the lender. oftmals der Verlust jeglicher Mittel zur Existenzsicherung steht. Profitabel sind sie hingegen für die wohlhabenden Kreditgeber. The following is a copy of an article written by Spanish writer Sebastian Vilar Rodrigez and published in a Spanish newspaper on Jan. 15 2008. It doesn't take much imagination to extrapolate the message to the rest of Europe - and possibly to the rest of the world. I walked down the street in Barcelona , and suddenly discovered a terrible truth - Europe died in Auschwitz ... We killed six million Jews and replaced them with 20 million Muslims. In Auschwitz we burned a culture, thought, creativity, talent. We destroyed the chosen people, truly chosen, because they produced great and wonderful people who changed the world. The contribution of this people is felt in all areas of life: science, art, international trade, and above all, as the conscience of the world. These are the people we burned. And under the pretense of tolerance, and because we wanted to prove to ourselves that we were cured of the disease of racism, we opened our gates to 20 million Muslims, who brought us stupidity and ignorance, religious extremism and lack of tolerance, crime and poverty, due to an unwillingness to work and support their families with pride. They have blown up our trains and turned our beautiful Spanish cities into the third world, drowning in filth and crime. Shut up in the apartments they receive free from the government, they plan the murder and destruction of their naive hosts. And thus, in our misery, we have exchanged culture for fanatical hatred, creative skill for destructive skill, intelligence for backwardness and superstition. We have exchanged the pursuit of peace of the Jews of Europe and their talent for a better future for their children, their determined clinging to life because life is holy, for those who pursue death, for people consumed by the desire for death for themselves and others, for our children and theirs..
What a terrible mistake was made by miserable Europe . A lot of Americans have become so insulated from reality that they imagine America can suffer defeat without any inconvenience to themselves. Recently, the UK debated whether to remove The Holocaust from its school curriculum because it 'offends' the Muslim population which claims it never occurred. It is not removed as yet. However, this is a frightening portent of the fear that is gripping the world and how easily each country is giving into it. It is now more than 60 years after the Second World War in Europe ended. This e-mail is being sent as a memorial chain, in memory of the, 6 million Jews, 20 million Russians, 10 million Christians, and 1,900 Catholic priests who were 'murdered, raped, burned, starved, beaten, experimented on and humiliated.' Now, more than ever, with Iran , among others, claiming the Holocaust to be 'a myth,' it is imperative to make sure the world never forgets. This e-mail is intended to reach 400 million people. Be a link in the memorial chain and help distribute this around the world. How many years will it be before the attack on the World Trade Center 'NEVER HAPPENED' because it offends some Muslim in the United States ? to pass this along. So COPY it NOW or show this web-link! Brussels, January 27th, 2012 – A full week of meetings commemorating the Wannsee Conference in Berlin and the victims of the Holocaust came to a climax in Brussels on Tuesday night, when the newly-elected President of the European Parliament, Martin Schulz, gave an official speech. In his speech, one of the first as a newly-elected president, he stated that ”his first obligation as President of the European Parliament is to defend the Jewish people and the State of Israel.” The statement came in his opening address at the 8th Annual Holocaust Remembrance Day in the European Parliament, co-organized by the European Coalition for Israel. The new president spoke from personal experience when he said that ”Germans born after the war are not guilty of what happened 70 years ago, but nevertheless responsible for remembering and passing on the remembrance to the next generation”. In a private interview with ECI on Tuesday night he explained that ”anti-Semitism is still very much an issue that needs to be monitored in Europe”. Earlier in the week he had taken measures to ban Holocaust denial in the European Parliament, a decision that was criticised by some, but applauded by others. Schulz was accompanied by his two predecessors, former President Jerzy Buzek, who also spoke at the event, and previous President Hans-Gert Pöttering, who was the first president to give the event official backing. -" The Holocaust did not start with the first train to Auschwitz, but long before, with hate speech and demonisation of a whole people group, which finally led to actions”, he said. "The train to Auschwitz could have been stopped in 1938 in Evian or in Munich, but the world community failed to act. He urged the European Union to learn the lessons and take firm actions now to stop Iran from acquiring nuclear capabilities. In a separate speech the current President of the European Jewish Congress, Moshe Kantor, struck a slightly more optimistic note, in that he applauded the European Union for blacklisting the Iranian Central Bank and banning the trade of Iranian gold and diamonds. As of July 1st, EU countries will no longer buy Iranian crude oil, worth about 20 per cent of its exports. Over the weekend, meetings commemorating the 70th Anniversary of the Wannsee Conference were also organised in Berlin by ECI chairman Harald Eckert and the German ”Initiative January 27”. The official Holocaust Remembrance Day will be commemorated around the world today, on Friday January 27th. On Sunday, January 29th, local churches across Europe will take part in the ECI campaign ”Learn from History” by commemorating the victims of the Holocaust in their Sunday services. THE EU plans to hammer Britain with a crippling new tax that will hit pensions, cost jobs and devastate business, it has emerged. The Franco-German plot will put Britain on course for another punishing clash with Brussels and leave David Cameron facing unrelenting demands for a referendum on our membership of the EU. French President Nicolas Sarkozy and German Chancellor Angela Merkel were yesterday edging towards a deal for a swingeing EU-wide financial transaction tax, despite fierce opposition from Britain. Sources in the French government said the two will discuss "rapid implementation” of the levy next Monday. Jean Leonetti, French minister for Europe, claimed it will be in force "by the end of the year”. David Cameron has to block this proposal. It is not in Britain’s interests; it will be immensely damaging. The latest plotting triggered fury at Westminster amid fears the levy could penalise the City of London and lead to up to 500,000 job cuts in the UK. It will add to the growing support for the Daily Express crusade to get Britain out of the EU. Downing Street also warned that the Prime Minister could be forced to wield Britain’s EU veto for a second time to block the plan. A refusal by EU leaders to guarantee protection for the City of London ignited a massive row at a Brussels summit on the euro crisis last month, culminating in Mr Cameron vetoing a prposed EU treaty shake-up. Chancellor Merkel has since been desperately seeking to mend fences with Britain. But the row erupted again yesterday when the French Government confirmed that the issue will be on the agenda for an informal EU summit in Brussels at the end of this month. The tax had previously been earmarked for launch in 2013. He claimed that all EU member nations except Britain and Sweden had backed the plan for the levy – known as the Tobin Tax after the economist James Tobin who devised it in 1972. Euro-sceptics last night urged Mr Cameron not to surrender to the latest threat to British business. Euro MP Nigel Farage, leader of the UK Independence Party, said: "It comes as no surprise that France and Germany are in full agreement on this tax. Why wouldn’t they agree to raid Britain to fund their own failures? Tory backbencher Douglas Carswell warned that Britain’s EU veto might be inadequate to block the tax. Under one plan being examined by the European Commission, a 0.1 per cent levy on share deals and 0.01 per cent levy on other financial products would be introduced to raise an extra £45billion a year for Brussels coffers. Last month, Chancellor George Osborne warned that the tax could drive billions of pounds worth of business from the City to New York, Hong Kong and Zurich. He described the proposal as "economic suicide” and "a bullet aimed at the heart of London”. The Government had made it clear "on many occasions” that it would not support the levy and it had "many allies”, he said. City experts also fear it could add hugely to costs for investors and have a devastating impact on the pension funds of millions of UK citizens. The tax has long been championed by senior Eurocrats, including EU Council President Herman van Rompuy and European Commission President Jose Manuel Barroso. Supporters claim the initiative would help regulate the financial sector and raise billions for EU projects. Left-wing campaigners were last night backing the tax. David Hillman, spokesman for the Robin Hood Tax campaign, said: "In these tough economic times, it is great news that Europe is acting to ensure the financial sector shoulders its fair share of the burden. Just before Christmas, German foreign minister Guido Westerwelle promised that his government would support a "prosperous City of London” and insisted his country had "no hidden agenda” to penalise UK business. "I was delighted to receive this e-letter from Ann Whitaker (KCTV-Reporter) in Cornwall who received this letter from Frederick Forsyth, who sent this open letter to Chancellor Merkel recently!" open letter to Chancellor Merkel recently!" Dear friends, for those of you who read, spy novel books! I was delighted to receive this e-letter from Ann Whitaker (KCTV-Reporter) in Cornwall who received this letter from Frederick Forsyth, who sent this open letter to Chancellor Merkel recently! Oh yes, you may like to read my earlier reply to Ann Whitaker - as I felt led to share a vision I had concerning Britain as a boat - floating on calm waters - but a storm is coming!!! Permit me to begin this letter with a brief description of my knowledge of, and affection for, your country. I first came to Germany as a boy student aged 13 in 1952, two years before you were born. After three extended vacations with German families who spoke no English I found at the age of 16, and to my pleasure, that I could pass for German among Germans. In my 20s I was posted as a foreign correspondent to East Germany in 1963, when you would have been a schoolgirl, just north of East Berlin where I lived. I know Germany, Frau Merkel, from the alleys of Hamburg to the spires of Dresden, from the Rhine to the Oder, from the bleak Baltic coast to the snows of the Bavarian Alps I say this only to show you that I am neither ignoramus nor enemy. I also had occasion in those years to visit the many thousands of my countrymen who held the line of the Elbe against 50,000 Soviet main battle tanks and thus kept Germany free to recover, modernise and prosper at no defence cost to herself. And from inside the Cold War I saw our decades of effort to defeat the Soviet empire and set your East Germany free. I was therefore disappointed last Friday to see you take the part of a small and vindictive Frenchman in what can only be seen as a targeted attack on the land of my fathers. We both know that every country has at least one aspect of its society or economy that is so crucial, so vital that it simply cannot be conceded. For Germany it is surely your automotive sector, your car industry. Any foreign-sourced measure to target German cars and render them unsaleable would have to be opposed to veto point by a German chancellor. For France it is the agricultural sector. For more than 50 years members of the EU have been taxed under the terms of the Common Agricultural Policy in order to subsidise France's agriculture. Indeed, the CAP has been the cornerstone of every EU budget since the first day. Attack it and France fights back. For us the crucial corner of our economy is the financial services industry. Although parts of it exist all over the country it is concentrated in that part of London known, even internationally, as "The City". It is not just a few greedy bankers; we both have those, but the City is far more. It is indeed a vast banking agglomeration of more banks than anywhere else in the world. But that is the tip of the iceberg. Also in the City is the world's greatest concentration of insurance companies. base metals, commodities, futures, derivatives, coffee, cocoa... the list goes on and on. And it does not yet touch upon shipping, aviation, fuels, energy, textiles... enough. Suffice to say the City is the biggest and busiest marketplace in the world. It makes the Paris Bourse look like a parish council set against the United Nations and even dwarfs your Frankfurt many times. That, surely, is the point of what happened in Brussels. The French wish to wreck it and you seem to have agreed. Its contribution to the British economy is not simply useful nor even merely valuable. It is absolutely crucial. The financial services industry contributes 10 per cent of our Gross Domestic Product and 17.5 per cent of our taxation revenue. A direct and targeted attack on the City is an attack on my country. But that, although devised in Paris, is what you have chosen to support. You seem to have decided that Britain is once again Germany's enemy, a situation that has not existed since 1945. I deeply regret this but the choice was yours and entirely yours. The Transaction Tax or Tobin Tax, you reserve the right to impose, would not even generate money for Brussels. It would simply lead to massive emigration from London to other havens. Long ago it was necessary to livein a city to trade in it. In the days when deals can flash across the world in a nano-second all a major brokerage needs is a suite of rooms, computers, telephones and the talent of the young people barking offers and agreements down the phone. Such a suite of rooms could be in Berne, Thun, Zurich or even Singapore. Under your Tobin Tax tens of thousands would leave London. This would not help Brussels, it would simply help destroy the British economy. Your conference did not even save the Euro. Permit me a few home truths about it. The euro is a Franco-German construct. It was a German chancellor (Kohl) who ordered a German banker (Karl Otto Pohl) to get together with a French civil servant (Delors) on the orders of a French president (Mitterrand) and create a common currency. Which they did. It was a flawed construct. Like a ship with a twisted hull it might float in calm water but if it ever hit a force eight it would probably founder. Even then it might have worked for it was launched with a manual of rules, the Growth And Stability Pact. If the terms of that book of rules had been complied with the Good Ship Euro might have survived. But compliance was entrusted to the European Central Bank which catastrophically failed to insist on that compliance. Rules governing the growing of cucumbers are more zealously enforced. This was an European Bank in a German city under a French president and it failed in its primary, even its sole, duty. This had everything to do with France and Germany and nothing whatever to do with Britain. Yet in Brussels last week the EU pack seemed intent only on venting its spleen on the country that wisely refused to abolish its pound. You did not even address yourselves to saving the Euro but only to seeking a way to ensure it might work in some future time. the Channel, Madame Chancellor, one can only say of the euro: YOU MADE IT, YOU MEND IT. RE: Is this The Hand of God helping us come to our senses?? It's Always good to take hills... & David will need partners he can really trust & speak their minds... Britain your destiny awaits you... 2012 ?!! A year to remember me thinks! THE BIG GREEK HOLE OF DEBT - EXPLAINED I THINK? EUROPES VISION 50 YEARS ON! European Central Bank chief Jean-Claude Trichet‘s announcement that the Bank for International Settlements is to become the primary engine for global governance is a shocking admission given the fact that this ultra-secretive menagerie of international bankers was once controlled by top Nazis who, in collusion with global central banks, funneled money through the institution which directly financed Hitler‘s war machine. During a speech to the elitist CFR organization earlier this week, ECB head Trichet said that the Global Economy Meeting (GEM), which regularly meets at the BIS headquarters in Basel, "Has become the prime group for global governance among central banks". The GEM is basically a policy steering committee under the umbrella of the Bank for International Settlements. In its current form, the BIS, which itself is not accountable to any national government, is comprised of banking chiefs from global central banks, most of which are private and also have no responsibility to their nation states or their citizens. The board of directors who control the BIS include Federal Reserve chief Ben Bernanke and Bank of England head Mervyn King, as well as Trichet himself. So how did the Bank for International Settlements get started? The BIS was founded in 1930 by Governor of The Bank of England, Montague Norman and his German colleague Hjalmar Schacht, who later became Adolf Hitler‘s finance minister. The bank was initially founded in order to facilitate money transfers related to German reparations arising out of the Treaty of Versailles, but by the start of the second world war, the BIS was largely controlled by top Nazi officials, people like Walter Funk, who was appointed Nazi propaganda minister in 1933 before going on to become Hitler‘s Minister for Economic Affairs. Another BIS director during this period was Emil Puhl, who as director and vice-president of Germany‘s Reichsbank was responsible for moving Nazi gold. Both Funk and Puhl were convicted at the Nuremberg trials as war criminals. Other BIS directors included Herman Schmitz, the director of IG Farben, whose subsidiary company manufactured Zyklon B, the pesticide used in Nazi concentration camp gas chambers to kill Jews and political dissidents during the Holocaust. IG Farben worked closely with John D. Rockefeller‘s United States-based Standard Oil Co during the second world war. Baron von Schroeder, the owner of the J.H.Stein Bank, the bank that held the deposits of the Gestapo, was also a BIS director during the war period. As Charles Higham‘s widely acclaimed book Trading With The Enemy, How the Allied multinationals supplied Nazi Germany throughout World War Two points out, several parties at the Bretton Woods Conference in July 1944 wanted to see the Bank for International Settlements liquidated, because its role in aiding Nazi Germany loot occupied European countries during the war. Norway called for the bank to be shut down, a view supported by Harry Dexter White, U.S. Secretary of the Treasury and Henry Morgenthau, but the BIS survived despite its highly contentious Nazi influence. Higham writes that the BIS became, "A money funnel for American and British funds to flow into Hitler‘s coffers and to help Hitler build up his machine," founded by Nazi finance minister Hjalmar Schacht on the basis that the "Institution that would retain channels of communication and collusion between the world‘s financial leaders even in the event of an international conflict. It was written into the Bank‘s charter, concurred in by the respective governments, that the BIS should be immune from seizure, closure or censure, whether or not its owners were at war." "The BIS was completely under Hitler‘s control by the outbreak of World War II," writes Higham. "Among the directors under Thomas H. McKittrick were Hermann Shmitz, head of the colossal Nazi industrial trust I.G. Farben, Baron Kurt von Schroder, head of the J.H. Stein Bank of Cologne and a leading officer and financier of the Gestapo; Dr. Walther Funk of the Reichsbank, and, of course, Emil Puhl. These last two figures were Hitler‘s personal appointees to the board." Higham details how the gold looted from countries invaded by the Nazis was packed into vaults controlled by the Bank for International Settlements, and how Nazis who controlled the bank then forbade any discussion of the theft. "The BIS was an instrument of Hitler, but its continuing existence was approved by Great Britain even after that country went to war with Germany, and the British director Sir Otto Niemeyer, and chairman Montagu Norman, remained in office throughout the war," writes Higham, explaining how Washington State Congressman John M. Coffee objected to American money being invested with the bank in 1944. "The Nazi government has 85 million Swiss gold francs on deposit in the BIS. The majority of the board is made up of Nazi officials. Yet American money is being deposited in the Bank," complained Coffee. In 1948, the BIS was finally compelled to hand over a mere £4 million in looted Nazi gold to the allies, and thanks to people like Harry Truman and the Rockefeller family, the bank was not dissolved. One of its most influential directors, Nazi banker Emil Puhl was later invited to the United States as a guest of honor in 1950. Despite its inglorious past, the Bank For International Settlements continues today as a major management arm of the global elite. The bank wields power through its control of vast amounts of global currencies. The BIS controls no less than 7% of the world‘s available foreign exchange funds, as well as owning 712 tons of gold bullion, presumably a sizeable portion of which is the bullion which was stolen from occupied countries by the Nazis who controlled the bank during the war. "By controlling foreign exchange currency, plus gold, the BIS can go a long way toward determining the economic conditions in any given country," writes Doug Casey. "Remember that the next time Ben Bernanke or European Central Bank President Jean-Claude Trichet announces an interest rate hike. You can bet it didn‘t happen without the concurrence of the BIS Board." The BIS is basically a huge slush fund for global government through which secret transfers of wealth from citizens are surreptitiously handed to the IMF. "For example, U.S. taxpayer monies can be passed through BIS to the IMF and from there anywhere. In essence, the BIS launders the money, since there is no specific accounting of where particular deposits came from and where they went," writes Casey. The fact that top Nazis were intimately involved in the activity of a global central bank that is now being touted as the primary powerhouse of the economic arm of world government is frightening. Every time we delve into the origins of the march towards world government, we find that top Nazis were instrumental in setting up and managing the same institutions that today seek to manage the imposition of global government. Just as with the institutions that comprised the embryonic stages of the European Union, Nazi fingerprints are all over the origins of the move towards a global authority ruling the planet with nation states and sovereignty playing second fiddle. This fact demolishes any notion that global government is benevolent, humanitarian or progressive. Centralization of power into the hands of the few is inherently undemocratic, elitist, and to the detriment of the people. The Nazis who breathed life into the same framework of global authoritarianism being used to set up world government today may have been usurped by an elite altogether more patient in their bid to impose a dictatorship run by banking dynasties, but the ultimate agenda remains the same - world government by consent or conquest. EU - SWINE FLU EXPOSED BY BRAVE JANE WHO? UPDATE ON - JANE BURGERMEISTER & STUFF! "...Our Reporters from KCTVMEDIA - helped to get the initial news story concerning "the SWINE FLU" jab - out-into the market place, back in Nov 2009 - We even went to the local Heath Authorities last November 2010...but nobody really wanted to know! Please - do your own research but don't stay quiet... Tell others... Share this information on today!" Simply get informed... shalom " Oz "
START THINKING OUTSIDE THE BOX! - INVESTIGATES CONERNING "Swine Flu "
Click Here > Other "TV & Media Links Concerning" - "SWINE FLU"
DAUGHTER OF ADOLF HITLER VOWS TO COMPLETE EUROPEAN UNION...? COULD THIS STORY BE TRUE ??? "I CAN SEE A BIT OF A LIKENESS...CAN'T YOU!" MORE REVELATORY NEWS IS PROVIDED ON PETER's WEBSITE BELOW!!! *WHY DON'T THE MAIN-STREAM UK MEDIA COVER THIS STORY ??? *THIS HAS GOT TO BE THE STORY OF THE CENTURY !!! © KCTV Media 2019 - What if the truth is out there?